Using Alaskan yellow and red cedars, Maligiaq Johnson Padilla assembles the frame of his Greenland kayak. Mind's Eye/True North Boats owner Marc Daniels steams pieces of hard oak in order to bend them to make the ribs of the kayak. 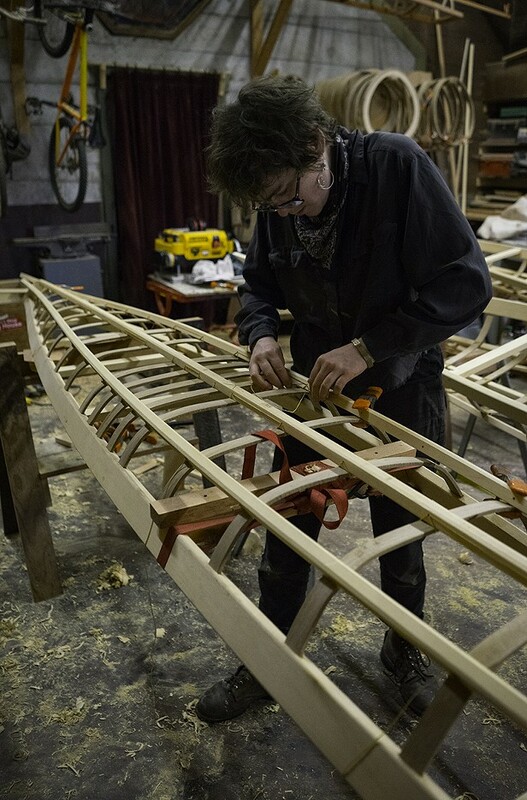 After assembling the frame and adding in the ribs, Mike Shimelpfening shapes the keel. Maligiaq and crew hard at work in the Mind's Eye Manufactory workshop. Brooke Cena installing the chines in the final stages of framing. Maligiaq measuring the driftwood masik, or thigh brace for the kayak cockpit. Maligiaq oiling the frame in the final step before skinning the kayaks. Ryan Bridges wraps the frame and sews the ballistic nylon to create the skin of the boat. Left to right: Mike Shimelpfening, Stan Beyer and Ryan Bridges nearing completion of the skinning process. Marc Daniels adds a custom touch to his kayak to commemorate the occasion. Stan Beyer contemplates his last few inches of sewing. Marc Daniels, Brooke Cena and Ryan Bridges in various stages of the building process. Brooke Cena and Mike Shimelpfening take to the water for their maiden voyage. Like a fish to water, the boats want to be wet, even though the are works of art worthy of a gallery wall. Mike Shimelpfening paddles in the distance at Trinidad Bay. In Greenland kayaking, rolling is the first safety skill taught. Maligiaq provides instruction to Brooke Cena in Trinidad Bay. Kayaks built specifically to the users size are incredibly easy for learning to roll. Brooke Cena nails her first hand roll in her second hour of kayaking as Maligiaq provides instruction. Maligiaq and Brooke celebrate her first successful hand roll. When the work is done, it's time to play. 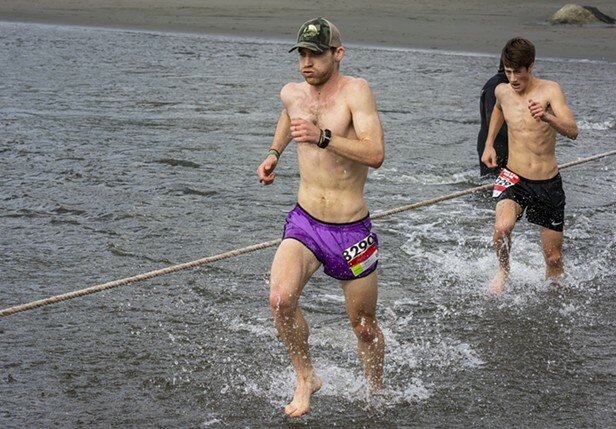 Maligiaq demonstrates the skills that made him a nine time Greenland International Qajaq world champion, performing several different rolls in rough water and wind. Maligiaq in his element, punching out through the storm surf in the boat he just built in Trinidad harbor. 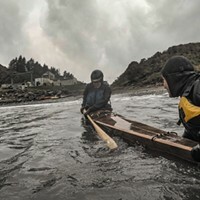 Maligiaq demonstrates the stability and rough water capabilities of the Greenland kayak.